Onion cultivation is a very profitable business. Onion plant can be cultivated as a monocrop or intercrop. Here is the complete guidance on onion farming including onion growing conditions, season, seeds, diseases and harvesting. Globally, China, India and US are the largest producers of onions with India being the second largest producer of onion. Indian onions have two crop cycles with the first onion harvesting during November to January months and second during January to May months. Hence, onion is available throughout the year in India. Botanical name for onion is Allium cepa– belonging to Liliaceae family. Its closest relatives are shallots, garlic and leeks. It is a bulbous plant with the bulbs being produced annually. The leaves are semi-cylindrical or tubular in structure. They have a waxy coating on the surface and emerge from a subterranean bulb that bears short, branched roots. The stem grows upto 200 cm in height. Flowers appear at the tip of the stem and are greenish-white in color. The bulb has several layers of overlapping surfaces around a central core and it can expand upto 10 cm in diameter. Onion needs a temperate climate and alluvial soil to grow in. Depending on the onion growing time and place of cultivation, onion can be grown as long day onions (for plains) or short day onions (ideal for hilly regions). Although it is a temperate crop, onion cultivation can be possible under sub-tropical, temperate or tropical climate. A mild, gentle weather that is not too rainy, too cold or too hot is ideal for onion growing. However, it can withstand extreme weather conditions at younger stage. Short day onions that need 10-12 hours of day length are grown in plains while long day onions requiring 13-14 hours of day length are grown in the hilly areas. 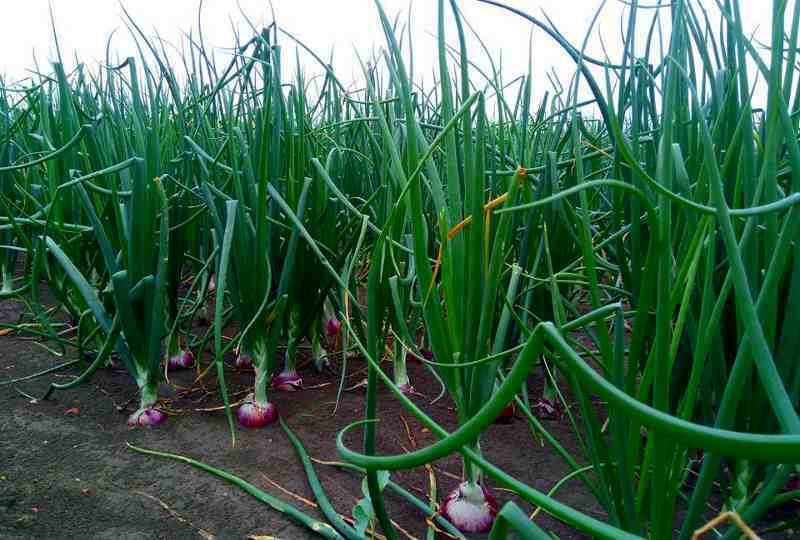 Onions can be grown in all types of soils such as heavy soil, clayey soil, sandy loam, etc. 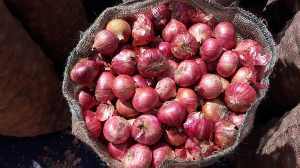 However, red to black loamy soil with good drainage capacity is ideal for onion cultivation. The soil must be friable, have good moisture holding capacity as well as enough organic matter. Although onions can be grown in heavy soils it must have a good amount of organic matter. Hence applying manure (farm yard or poultry) at the time of field preparation in case of heavy soil onion cultivation is important. In addition, onions cannot survive in saline, acidic or alkaline soils. Soil with neutral pH (6.0 to 7.0) is optimal for onion cultivation. It can tolerate mild alkalinity (pH upto 7.5). They cannot survive if the soil pH drops below 6.0 owing to aluminum or manganese toxicity or trace element deficiency. Onion crop irrigation depends on the season of planting, type of soil, irrigation method and age of the crop. Generally, irrigation is done at the time of seedling plantation, during transplantation period, 3 days after transplantation and subsequently at regular intervals depending on the moisture content in soil. The last irrigation is done 10 days before harvesting onion. Being a shallow-rooted crop, onions need small amounts of irrigation at regular intervals. This helps maintain optimal soil temperature and moisture for growth and bulb development. Excess irrigation followed by dry spell would result in bolter formation and splitting of outer scales. Modern irrigation techniques like drip and sprinkler irrigation are used as they help prevent excess water loss. These techniques help maintain the ideal moisture level in soil. In addition, dispensing water through drip or sprinkler emitter would ensure water at the root of the plant. It prevents water seepage into the soil and thus water loss to a great extent. Onion being shallow-rooted is suitable for intercropping. In other words, two or more crops can be grown together. However it also depends on location, nature of soil and climatic conditions. The main idea of inter-cropping is to use the resources effectively and gain a great yield without causing any harm to the main crop. If onion is planted as rabi crop then it can be paired with sugarcane. For this, furrows and ridges are prepared for sugarcane. After two rows of sugarcane, a flatbed for onion is prepared. Both onion seedling and sugarcane is planted simultaneously. This type of planting under drip irrigation helps save 25-30% water. Being a shallow rooted crop efficient and optimal utilization of all the applied soil mineral nutrients is unlikely. The unused nutrients would leach down and settle in the sub-soil. In the next growing season, planting leguminous crops would ensure utilization of these nutrients. Thus, onion and legume cultivation sequence is recommended for maintaining soil health, optimum nutrient utilization and higher yield. Exported to Europe, Australia and America. Matures in 125-140 days after transplant. Matures in 130-135 days after transplanting. Grown successfully during rabi and kharif in the South. Matures early- within 140-145 days of transplanting. Exported to Malaysia to Singapore. Suited for Andhra Pradesh, Eastern Madhya Pradesh and Orissa. Red colored, round shaped bulbs. Onion can grow in almost all types of soils. Generally, the seeds are sowed in nursery and the seedlings are transplanted after approximately 30-40 days. Before transplantation the field must be ploughed properly to get rid of the soil clods and unwanted debris. Vermicomposting (approximately 3 tonnes per acre) or poultry manure can be incorporated. This is done during the last ploughing. After ploughing the fields are levelled and beds are prepared. Depending on the season, the beds maybe flat beds or broad bed furrows. Flat beds are 1.5-2 meter in width and 4-6 meter in length. Broad bed furrows have a height of 15 cm and top width of 120 cm. The furrows are 45 cm deep so as to get the right spacing. Onions are cultivated in broad bed furrows during kharif season since it is easier for excess water to drain out through the furrows. It also facilitates aeration and reduces occurrence of Anthracnose disease. Flat beds are made if onion cultivation is done during rabi season. Flat beds for kharif can cause water logging. Onion seeds are first sown in nurseries and later transplanted to the open fields. Nursery management and transplanting are hence the most important steps in onion cultivation. For one acre of onion plantation, seedlings can be prepared in 0.12 acre of area. The nursery field must be ploughed well and made free of clods. The soil must be reduced to finer particles so as to hold enough water. The filed must be clear of stones, debris and weeds. Just like the main field preparation, farm yard manure (half ton) must be applied at the time of last ploughing. Raised beds are recommended for nursery preparation. This is because flat beds allow water movement from end to end. There is a risk of seeds getting washed away in the process. The beds must be raised to a height of 10-15 cm, width of 1 m and length as per convenience. Keep a distance of at least 30 cm between the beds to allow easy drainage of excess water. 0.2% Pendimethalin is used for controlling the weeds in the nursery. 2-4 Kg of seeds is required for one acre of onion cultivation. Seeds are treated with 2g/Kg of thiram or Trichoderma viride to prevent damage from damping off diseases. The seed distance is maintained at 50-75mm to facilitate easy weeding and removal of seedlings for transplantation. The seeds are covered with farm yard manure after sowing and watered slightly. The seedlings are transplanted into prepared beds at a distance of 10 cm between plants. Controlling thrips is to extent seen effective in controlling the disease. Spaying fungicides like 0.25% Mancozeb, 0.1% Tricyclazole, 0.1% Hexaconazole or 0.1% Propiconazole every 10-15 days interval starting from 30 days after transplanting or as soon as disease appears. Onion harvesting is done when the still green tops start drooping. The plants are gently pulled out from the soil. However, 10-15 days before harvesting irrigation of the field is stopped. The crop is also sprayed with 1000 ppm carbendazim 30 days before harvest. This helps increase the shelf-life of the crop. The bulbs are cleaned and dried in shade for 4 days. After harvesting, the bulbs are graded according to their size as A (more than 80mm), B (50-80 mm) and C (30-50 mm). In India, this is done manually as well as via machines. Generally, onion bulbs harvested in rabi season have better shelf-life than kharif. Light red onion varieties have better storage potential than the dark red varieties. They are stored in jute bags or wooden baskets. They are also stored in netted bags. This is important because onions emit gas which if may lead to rotting if not allowed to escape. Optimum temperature for storage is 30-35˚C with 65-70% relative humidity. Cold storage increases the shelf life. The loss of crop after storing in cold for six months has been found to be 5%. However, extremely low temperature (less than -2⁰C) can lead to freezing injury. A high temperature can cause rotting. A gradual decrease of temperature prevents microbial decay. In the recent years India faces a shortage in onion on a yearly basis and this triggers price rise. 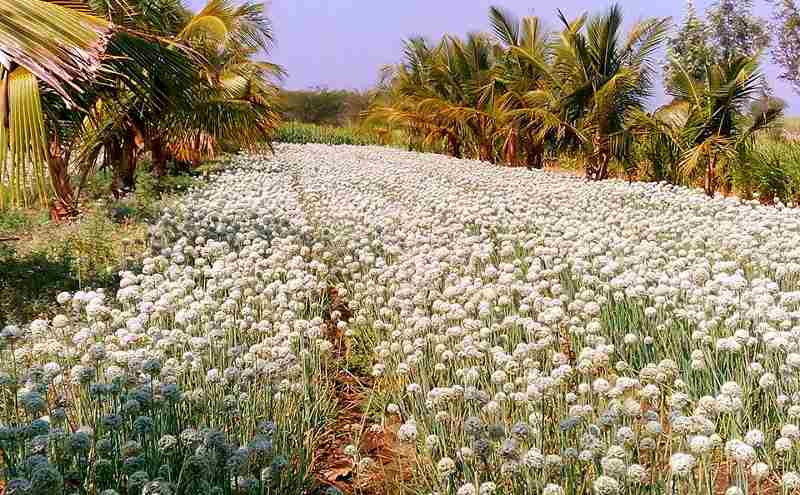 Therefore, onion cultivation can be a huge money making agribusiness.